Wow, almost a year to the day since my last blog post. Hey again - it's nice to see you, if you've stuck around this long! The last year has still been that uphill struggle with my beads, ever since my Standing Rock post, and I have still been art journaling and taking mixed media classes. There ya go, you're up to date, lol! 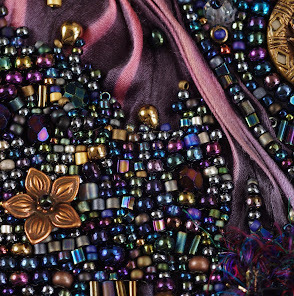 But I have been noticing my beads more and more, and had an idea that came directly from my art stuff. In art journaling, sometimes there is either an overabundance of inspiration (it comes at you in droves from Pinterest, social media, anywhere you look online, and most especially in art classes and your brain simply can't hold it all) or a complete absence of it (omg look at that very blank white page and my brain just turned off completely), and lots of artists use prompts in many forms to help themselves get going. There are artists who provide a weekly or monthly (sometimes daily) prompt in their blog posts, and some who make up decks of cards with ideas on them which they can shuffle and choose from, and some who make sticks (like popsicle sticks with words on) they can choose from, there are books devoted to them, classes devoted to them, there are timed challenges and weekly challenges devoted to them. My plan is pretty wide open; it could be something as broad as 'herringbone stitch' or 'earrings' or as narrow as 'bead a tree' depending on what hits me at the time. Some months (like this month!) I will have something free to gift with the prompt, and some months I will maybe just have the blog post and a photo and a few links. The big thing is that *I* participate and make something that matches my prompt, even if no one else wants to play along - but I hope you will! 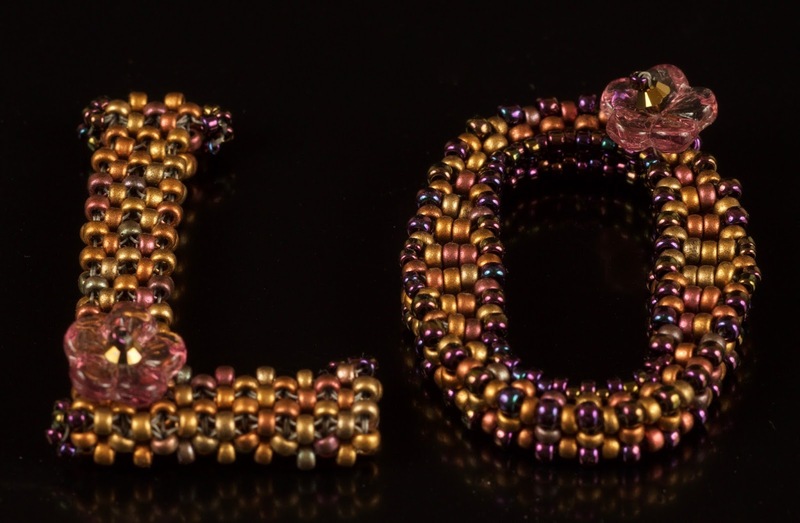 SO, January's prompt is 'Bead A Flower.' (I have no idea why flowers, it just seemed like a fun and cheerful sort of thing, and we all definitely need some of those.) I have started a Facebook Group for my prompts, and will be including a PDF to download in the group; a tutorial of how to create the same flower I did. 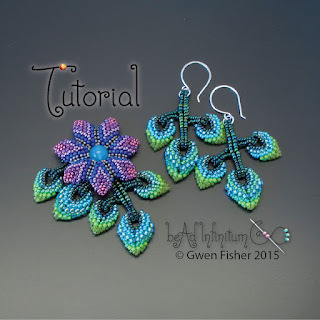 These are 'In Bloom' flowers, which are part of a tutorial I have for sale in my shop, but divorced from their native necklace (the PDF only includes directions for the flowers, NOT the entire In Bloom necklace). Use them however you like - you could turn them into brooches, or pendants, or leave them as is or make stems for them and stick them in a vase as a pretty decoration. Mine is as yet unfinished - I know I won't be making a bunch more to make another In Bloom necklace, but it may yet turn into a pendant. :) If you'd like the PDF, and want to join in, come to Facebook and ask to join the group HERE. 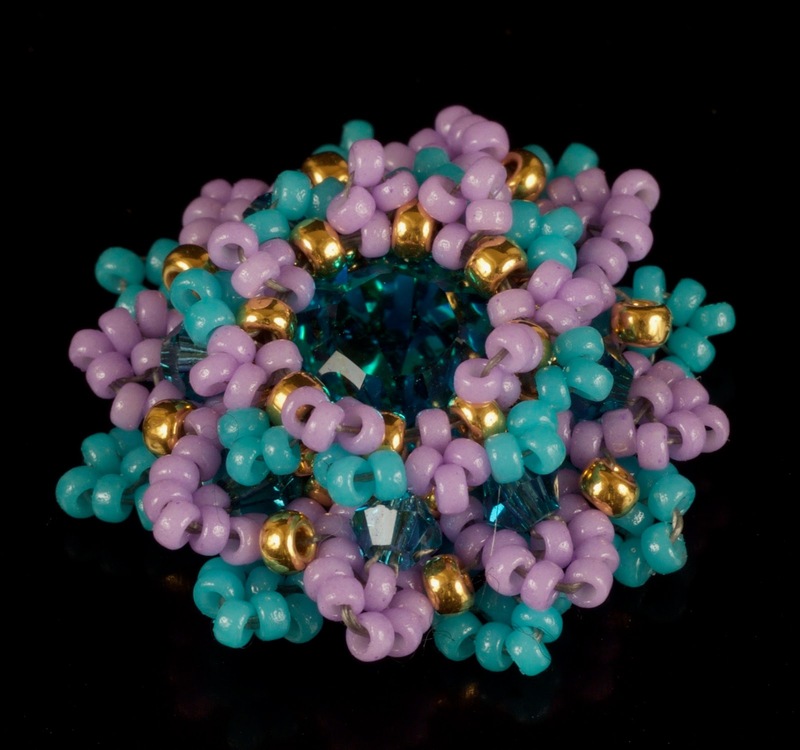 Here's my January In Bloom Flower in purple and teal! In case my Bloom doesn't tickle your fancy, but you'd still like to make a flower, I thought I would also provide a few links to beaded flowers I love - these are flowers by friends, and the name of the flower is the link to their shop/tutorial. 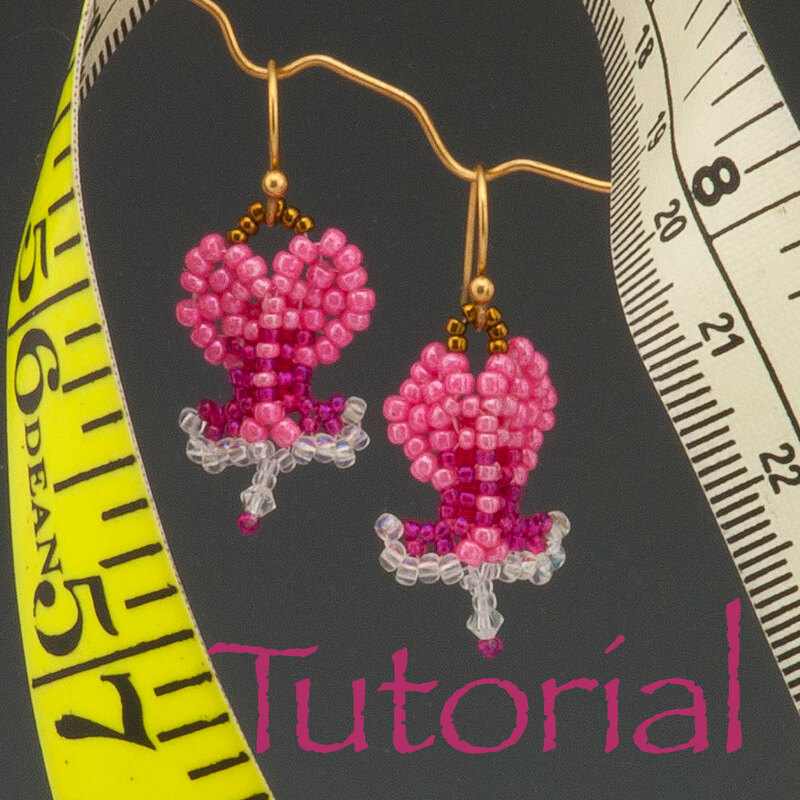 These are gorgeous - Bleeding Heart Earrings by Cynthia Newcomer Daniel - so dainty and sweet! And this beautiful Ruffled Rose by BeadsbyBecs - so pretty and so much fun to make. 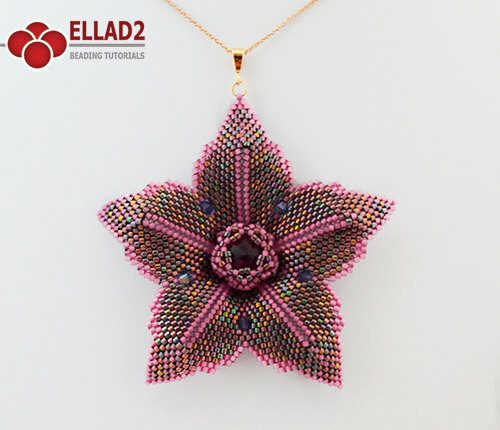 And then there is this stunning Clematis by Ella Dess! And these fabulous Cellini Flowers and Leaves by Gwen Fisher. 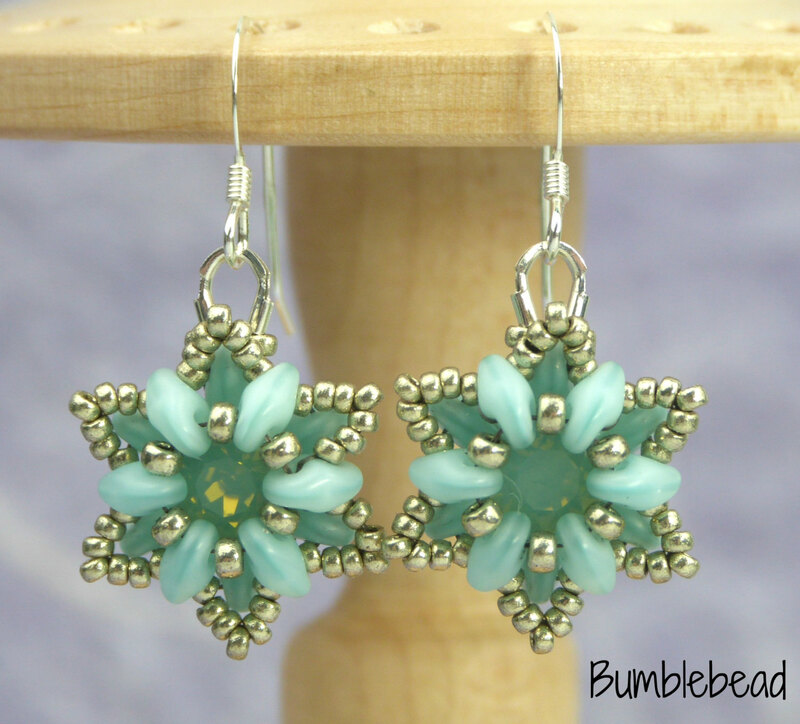 And also, these stately and elegant Crown Flowers by Carol Paris of Bumblebead. I would love to see any flowers you make for this, and it would be great if you came and joined the FB group, I hope to see you there! Here are my L and O... looking forward very much to V and E! 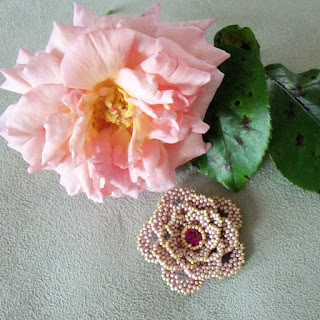 These are all lovely, and a great return to the Blog Nancy, maybe I will start up again soon too! YAY!!! And I hope you can come and have some fun, too, even if you decide not to join in the prompts there will probably be some nice eye candy. Can't wait to see your bright floral! Beautiful post Nancy. You're off to an excellent start with your monthly prompts. Thank you, Gwen! Thank you for allowing me to post your gorgeous tutorial and your photo! 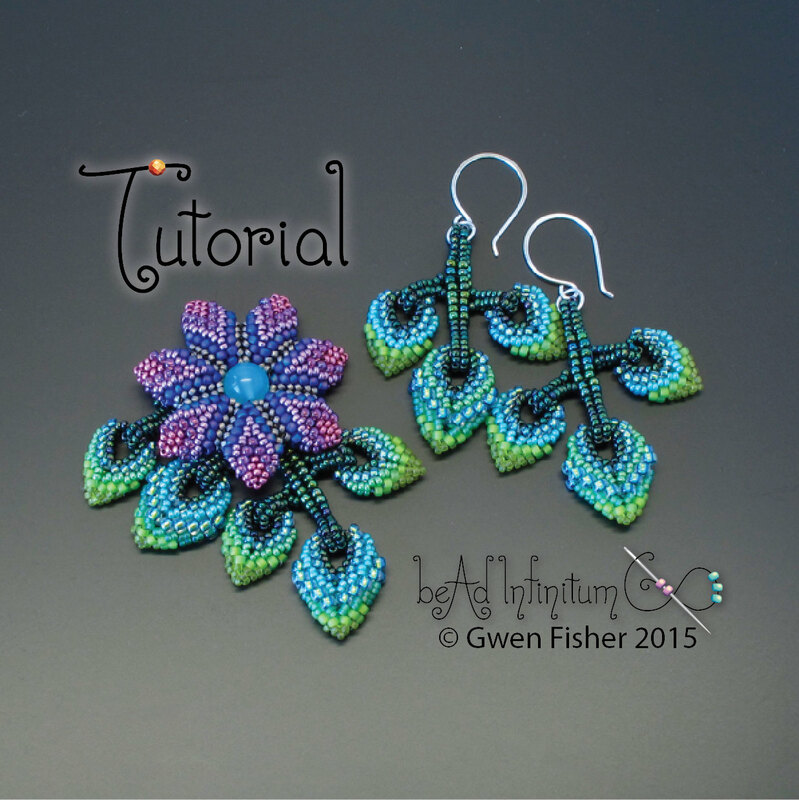 A beading prompt is a wonderful idea. I'll be joining you! Glad to have you back. Wish I could play along but my life has been too busy to do much more than enjoy a bit of eye candy every week. Great idea Nancy I believe I will play along. I too have not blogged for almost a year it will be a year on the 28th. 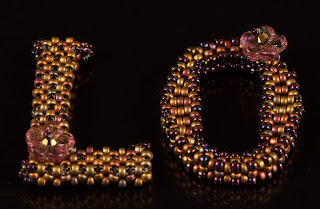 I have heard of Marcia's Bead Love but have not checked it out yet. I have missed your beautiful beadwork Nancy. Welcome back. I happen to be beading flowers myself! Love you.